With the Kurdistan referendum in the Kurdish region of Iraq quickly approaching, many of the processes set in motion years ago, even decades or 100 years ago, are coming together. On September 15th the Kurdistan Parliament approved the referendum on September 25. There have been many surprises since the June announcement, but many reactions have been expected. Most disappointing has been the US response. Officialdom and the State Department obviously oppose the referendum because they are committed to the status quo and Iraqi “unity.” But more could have been expected from the US Congress and other parts of the US government. On September 15 the White House released a statement opposing the referendum. “We therefore call on the Kurdistan Regional Government to call off the referendum.” An unprecedented decision to meddle in the internal affairs of another country, ostensibly clothed in the need to defeat ISIS. Nevertheless a lot of the coverage in the US media, including opeds, have been positive. Jonathan Tobin wrote a piece at the New York Post saying Kurdish independence would be a win for America. Some of the articles are still tinged with an arrogant, almost neo-colonial, language. One notes that the Kurds have “earned” their right to independence. Did Kosovo or East Timor or Kenya have to “earn” its right to independence? What about Czech Republic or Poland or the United States? Why do Kurds need to “earn” this right, a right many other people’s have received? Another article at The Economist notes that America and Iran agree on opposing Kurdish independence and the referendum. This may cause many to wonder why the US and other western countries are not supporting Kurds in what is simply a vote and self-determination. Why aren’t they standing more closely with a country that has a relatively free press and democratic tradition and has been a key ally against ISIS, one that is pro-Western and had developed its economic and political potential. The US Special Presidential Envoy for Global Coalition to Defeat ISIS, Brett McGurk, found himself at the center of the controversy over Kurdistan’s planned September 25 referendum on September 14th during meetings in the Kurdish region. He called it a “historic gathering in Dohuk with President Barzani, the UN, UK and USA.” The assumption was that along with other western countries they were trying one last attempt to pressure the Kurdistan Regional Government to cancel its planned referendum. However the read out of his press statement from Erbil concentrated on the upcoming Hawija operation and praise for the Peshmerga. The language McGurk employs reads like that of a proconsul, to some it sounds almost in line with previous eras of colonial overlords, speaking down to the native locals and scolding them. It’s like Sir Percy Cox, but the 21t century. Laurie Mylroie at Kurdistan24 compared McGurk to Lawrence of Arabia. In some ways this is a legacy of the Bush years when Paul Bremer and others were seen as proconsuls. Colin Powell told Bush before the 2003 invasion “if you break it, you own it.” (Powell took it as a phrase from Pottery Barn, ‘if you break it, you buy it’). Since then the US has seen itself as the responsible “owner” of Iraq, which has ignored the overall interests of many groups in Iraq in pursuit of certain goals. The current goal is unity. Kurds are in the way of that goal, but the Kurdish region of Iraq has also been a recipient of US aid and support for decades. In recent years this also means financial support for the Peshmerga and training. So it is not a one way street. 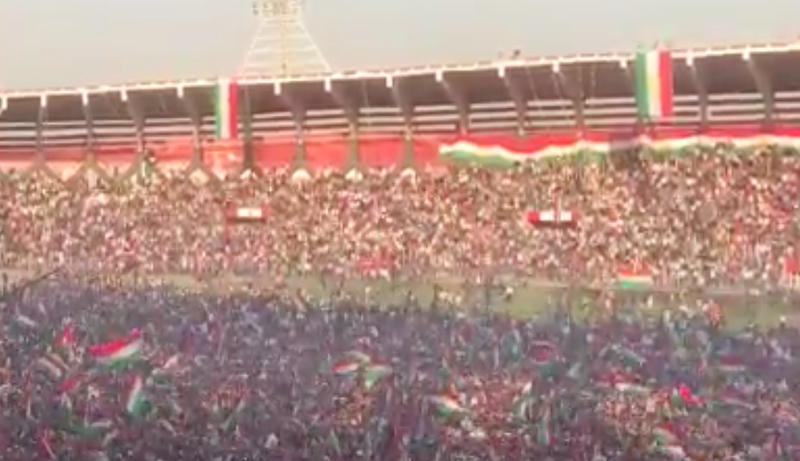 Despite the uncertainty and controversy, the rallies in Kurdistan have grown by the day. On September 14th more than 20,000 (some said 50,000) rallied in Zakho in support of the referendum.“Referendum is a tool, not an objective. The objective is independence. 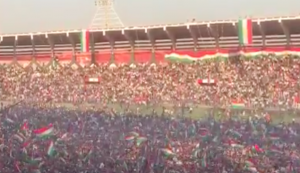 The objective is for us to determine our fate,” Barzani told the crowd. In Akre on Sunday the 10th thousands also rallied, ascending the mountain with torches and flags. On September 12th President Barzani went to Kirkuk where he sat at a table with Vice President Kosrat Rasul and Kirkuk Governor Najmaldin Karim and emphasized the special status of Kirkuk. “Kirkuk should have a special status within the independent Kurdistan based on genuine partnership,” senior assistant Hemin Hawrami tweeted. The issue of Kirkuk has dominated politics for decades and the visit was a reminder of past historic speeches about the city, such as Jalal Talabani’s 1992 speech. The high hopes for the referendum seem to be spreading after many months of a dull and almost non-existent campaign. On September 5th the campaign for the referendum official began.“The people of the Kurdistan Region deserve an independent state after centuries of struggle. Let’s end subjugation by voting in favor of independence on September 25,” one of the demonstrators told Kurdistan 24. New videos supporting the referendum, often emphasizing diversity, have been produced. There are billboards and a great deal of discussion on social media. Under hashtags such as #YesKurdistan, supporters are tweeting images, logos, rallies and messages of support. Kurdistan is still trying to reach out abroad with meetings in the UK and elsewhere. It appears that the decision to wait until September 5th to begin a major campaign for the referendum was because of discussions and possibilities that it might be postponed. Rumors persisted even on September 15th that due to US and international pressure for an “alternative” it could be postponed. But there is no clear alternative. Instead Baghdad sought to pressure the KRG by trying to fire the governor of Kirkuk, Najmadin Karim. The KRG nor Karim will accept the Baghdad decision. The US concern that the dispute could meddle in the Hawija operation makes sense, since Hawija is near Kirkuk. ISIS would like to exploit the dispute and it has continually carried out attacks near Kirkuk. Attacks in southern Iraq killed 60 on September 14th. One of the common sights at pro-Kurdish rallies in recent weeks in Europe has been the Israeli flag. 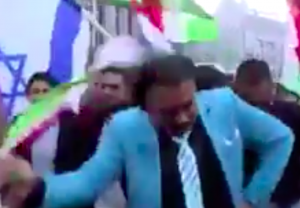 In Geneva on September 10th the flag was front and center. The same was the case in Oslo, Norway during a rally on September 9th. On September 15 in Koln. On September 16th at rallies in Hamburg and Stockholm. 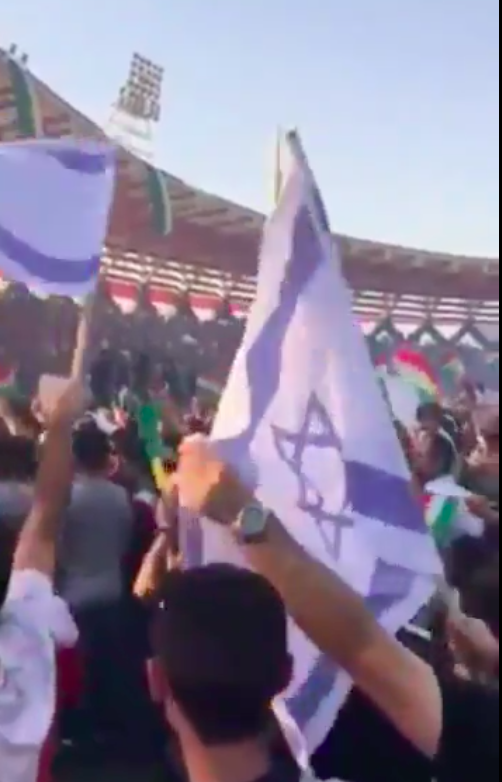 In Kurdistan the appearance of Israeli flags has also become a phenomenon. 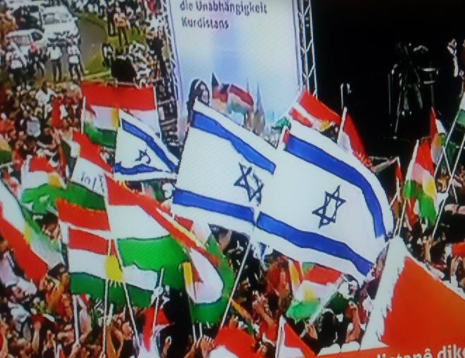 At a meeting in Shingal an Israeli, German and other flags were on a table. In Israel several political leaders have reiterated support for Kurdish independence and rights to a referendum. Israel’s Justice Minister Ayelet Shaked on Monday September 11 speaking at the ICT’s World Summit on Counter-Terrorism supported Kurdish independence. “”Israel and countries of the West have a major interest in the establishment of the state of Kurdistan…I think that the time has come for the U.S. to support the process,” she was quoted as saying. As the referendum nears the issues relating to the international community, the Kurdish parliament, Iran, Turkey and other regional responses will gain in importance. Gorran and Komal (KIK-Kurdistan Islamic Group) parties did not attend. 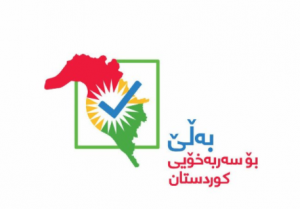 “Gorran and Komal, two parties who have not yet supported holding the referendum at this time, have said they will not attend today’s session because believe parliamentary procedures convening the legislature have been breached,” Rudaw noted. Together they have 24 and 6 members of the KRG parliament. The Kurds are not the only people in recent years or decades to seek independence by referendum. Scotland, Quebec, South Sudan, East Timor, Kosovo and other countries have carried out referendums or sought independence, some successfully and others have made the choice to remain. The UK has also sought to leave the EU through a referendum. Catalonia is seeking to hold a referendum on October 1 and Spain has behaved in the same manner that Iraq has toward the Kurds. It has sought to cut off funding to Catalonia. It has gone further and attempted to seize ballot boxes in the region. It has threatened to arrest mayors. Unlike in the Kurdish region, the US and other states have not sought to meddle or interfere in what is an internal issue. In some ways the US has taken on the mantle of Sykes-Picot in the Middle East, 100 years after the French and British carved up the remains of the Ottoman Empire, the US is trying to play the balancing hand and to decide who will receive what after the demise of ISIS. This is a historic mistake for the US, since traditionally it opposed colonial powers and has supported self-determination as a policy. Clouded by the Cold War and the War on Terror, its policy has become less clear. On the Kurdistan issue it had a chance to support a close ally, and so far it has failed in its chance.